Andara is a New Age crystal formation, which is here to assist us to move beyond time barriers, through interdimensional vectors and integrate with future forms. 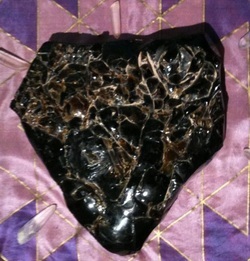 I have a large golden brown Andara on my altar called "The Heart of the Dragon". I have been working with it since last winter and I feel I have just begun to touch the edges of all that this crystal being is and what it is bringing in. The Andara glass crystals absorb and reflect physical light towards the center of its crystaline spiral matrix. Andara is very healing if you gaze into it while it is held in either natural sunlight or artificial light and brings your consciousness into more intimate contact with the Andarean consciousness. The Andareans were colonists of ancient Lumeria. The stones, such as Andara and the Lemurian seed crystals have begun to reseed their consciouness on Earth to help us initiate the New Golden Age. Andara is found in California and identified by the Native American Indians as ancient healing stones. I have seen them in brilliant shades of blue, yellow and green as well as the golden brown heart in my collection. My friend Nicholas Hardy has a milky blue green Andara, which he calls the Unicorn and it certainly aligns energetically with the magical mystical powers attributed to the Unicorn consciousness. The green Andara carries a clear green ray, which reminds me of the Gaia Stone. The Gaia Stone was discovered in the aftermath of the Eruption of Mount St Helens. Likely the composition its similar because both are volcanic glass crystals. Andara is unique as it is the result of monatomic metallic elements that are found naturally in the Etherium powders heated to high temperatures. This process not only transmutes the Etherium powders, but refines the monatomic metallic metals and enhances their exotic properties. Testing has shown that Andara crystal glass resonates at the high frequency of the exotic matter they were created from. In my personal connection with "The Heart of the Dragon" Andara I find myself grounded in a field of the most exquisite harmonious and balanced light energy. For me it is a gift from the Heart of the Earth. It grounds the energy of unconditional love from the divine feminine. "...Approximately 2000 years after the interdimensional implosion had occured, a Lemurian temple complex was raised on this site. The name of this temple was 'Andara', meaning Light of Beauty and Perfection. The primary purpose of this complex was in working with the prima matra powders, crystals, and water of the land..."